Politicians have successfully used the “anti-Sharia” card as a tool to gather votes. If one listens closely to the hysterical rhetoric of the Islamophobes, we are to believe that the United States of America is facing multiple threats at the hands of Muslims, with the aim of forever altering the framework of this country, as we know it. Heading the list of imminent threats is the establishment of Sharia — Islamic Law. Those who fear Islam have gone so far as to blame the looming danger of Sharia in America for the need to infringe on Muslims’ civil, social and religious rights by blocking the building of masjids, Islamic centers and Muslim graveyards, and by altering primary educational materials that introduce Islam or teach Islam as a part of human history akin to their practice of erasing the true facts from history books regarding slavery and treatment of native Americans. A fact that may shock many is that Sharia is not a thing that Muslims need to bring about or even reject in order to embrace American law. It already exists in America. Sharia has been present in American law since the first writing of the U.S. Constitution. This is a fact that would be missed by most, unless one has been educated in Islamic Studies, which the majority of Americans have no knowledge about; this includes the politicians and so-called experts on “radical Islam”, who do not know what Sharia is. Sharia stems from the immutable law of the Almighty Creator: The Divine law of the Almighty Creator that was sent to the Holy Last Messenger (peace be upon him) and is found in the Holy Qur’an. The U.S. Constitution upholds many of the tenets of Sharia, whether people know it or not, like it or not. It is an established fact that the U.S. Constitution is more Islamic than the government systems of Saudi Arabia and many other “Islamic” countries. A considerable portion of the rights guaranteed by the U.S. Constitution are rights established by Al-Islam, such as the right to vote, freedom of religion, right to bear arms, the establishment of military and much more. Sharia governs Muslims in how they must deal with each other, as well as non-Muslims. So why are some Americans worried about Sharia? Perhaps the “anti-sharia” hate-mongers are afraid of the fact that it would give those cheated and abused in the past the right to prosecute those who had wronged them — whether by destruction of their properties, physical harm that was rendered, and/or wealth that was usurped. Under Sharia, a person’s lands, if taken unjustly, would have to be given back to them. Following Sharia, the U.S. would owe its very existence to Native American tribes. 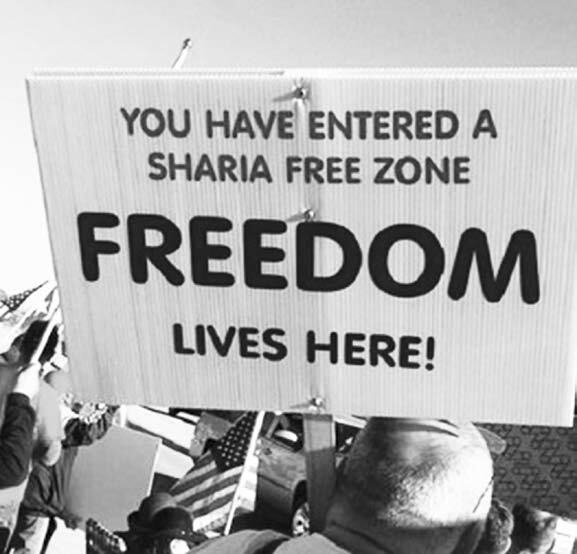 Americans have no reason to fear Sharia. Muslims are quite content with the current state of American Sharia Law. Establishing Sharia in America is not a concern for Muslims. Especially since it’s already here.